This Italian salad dressing recipe uses a very easy method that results in a perfectly emulsified vinaigrette. The tiny dash of Dijon mustard, when shaken, keeps the oil and vinegar mixed together for restaurant-quality results. Serve it on a mixed green salad with cucumber, tomatoes, and feta cheese, as well as in pasta dishes and in marinated vegetable salads. 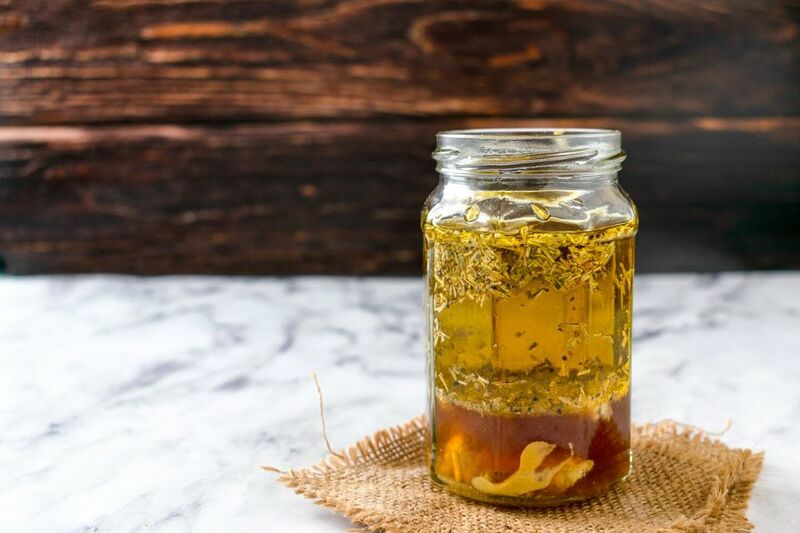 Combine the vinegar, olive oil, salt, sugar, pepper, herb blend, mustard, and garlic in a glass jar with a screw-on lid or another container with a tight-fitting lid. Tighten the lid and shake vigorously for 1 minute before serving. Refrigerate overnight for best results. Shake before serving. The dressing can be stored for several weeks in the refrigerator. Add crushed red pepper flakes to this Italian dressing recipe to turn up the heat. Bacon and onion powder can be added for a more complex flavor. Add honey to this recipe to turn it into a honey-mustard dressing. Make a creamy vinaigrette by mixing the oil, vinegar, salt, and pepper with mayonnaise or sour cream. Add grated Parmesan cheese and freshly ground black pepper to the creamy vinaigrette for an original and tasty spin. If you like balsamic vinegar, make an Italian dressing with a twist on traditional by substituting balsamic for red-wine vinegar, and mixing that with olive oil, Italian seasonings, garlic, and pepper. Dressings carry flavor through every bite and infuse whatever dish you use it on. Green salads are without a doubt the most common use for all dressings, including Italian, but don't stop there. These blends of oil, vinegar, and seasonings make taste spectaculars of otherwise boring and/or bland dishes. Italian dressing makes a terrific marinade for grilled chicken and steaks and can turn a cheap steak cut into something that's actually worth eating. Mix it into ground beef for a boost in flavor and a change-of-pace burger. It also can turn potato or pasta salad into a star when it's mixed with more mustard, olives, and red onions.